According to Richie Furay, Buffalo Springfield plans an extensive tour this September. But original member Richie Furay revealed on Friday that the group has plans for a more extensive tour this fall, beginning in September. Furthermore, he says, all of the shows are being recorded, leaving the possibility of a live album on the table. As for recording new music in the studio, Furay allows that it's anyone's guess -- but even that is a possibility. "There will be a fall tour -- September, October, November," Furay told Billboard.com. "We have a bunch of cities for the fall that we're looking at right now to just logically put together." 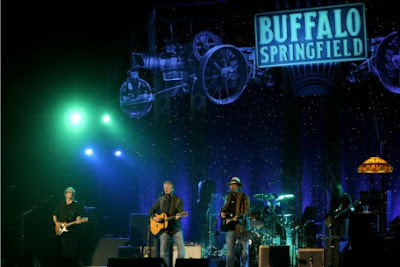 More on Buffalo Springfield's concert in Oakland, CA, June 1 & 2, 2011. Glad to hear it. Looking forward! Wish they'd announce the Red Rocks shows already! Someone have a setlist from Thurs. night, 6-2-11? Always linked in the right sidebar. A vinyl box set of the group's three albums, titled "Buffalo Springfield Complete," is due out soon! We love vinyl box sets! eh, i'll go see 'em if they come, but the shows sound a bit boring to my ears. no real highs that i hear, and i assume they are going to stick to this setlist and these arrangements. i mean it's great for all you geezers from a nostalgia standpoint, but i ain't a neil young fan for nostalgia's sake. man, stills' voice is shot. to quote rick james, cocaine's a helluva drug! great to hear neil and richie still hitting most of their notes, although time is catching up with them too. "Anonymous said...man, stills' voice is shot. to quote rick james, cocaine's a helluva drug! great to hear neil and richie still hitting most of their notes, although time is catching up with them too." That would also explain why drummer Joe Vitale is singing backup harmonies. Who knows, maybe Rick-the-Bass-Player could help out...give him a mike!